From Red Guards to Cyber-vigilantism to where next? "...have stood facts on their head and juggled black and white, encircled and suppressed revolutionaries, stifled opinions differing from their own, imposed a white terror, and felt very pleased with themselves." One might be inclined to use similar words to describe the officials whose holiday video from a taxpayer-financed African junket recently got uploaded onto the internet. Click here for the full video. When I watch China's human flesh search engines in action I often think of the Cultural Revolution and the Red Guards. Unlike the Red Guards they're not really being manipulated by one charismatic leader (yet); they're just acting on their own. Like the Red Guards, the intent of today's cyber-vigilantes is idealistic; they believe in their absolute moral righteousness. Sometimes they expose corrupt and venal officials who deserve to go to jail. Other times they conduct moral witch hunts against people whose behavior may not be very admirable but what crime did they commit exactly and who is to be the judge? It is very exciting that the Internet is making it increasingly difficult for Chinese government officials to behave irresponsibly, abuse taxpayer funds, or commit crimes without being exposed. The question is, where is this all headed? Mao was frustrated that he could not adequately control the Communist Party bureaucracy, who he believed had grown too fat and happy and "bourgeois;" so he unleashed the Red Guards on them. Today many Chinese complain that the central government has lost control over provincial officials to some extent, and county officials to a great extent. The central government is fairly well regarded by the public while local governments are widely hated. How will this loss of control by the center over the localities be handled? Via real reform of political institutions and mechanisms of justice so that government at all levels can be held accountable by the governed in a fair and systematic manner? Or through an updated form of cyber-populism (cyber-bonapartism?) in which people are empowered to speak out and to act against injustice in many cases when such actions don't hurt the power of the top leadership - but without the institutions or rule of law or real reforms that would underly a commitment to build truly accountable, transparent, and representative political institutions? In the 1990's, some hopeful officials in the Ministry of Civil affairs advocated direct, competitive, secret ballot elections as the solution to social unrest and corruption. Programs to institute such elections at the village level were celebrated in the West as a sign that China might eventually be capable of democratizing. Studies at the time indicated that villages with fair and competitive elections had less unrest than those that didn't. But the efforts to bring free, fair and competitive elections to all villages throughout China were abandoned by the early 00's as China's top leadership transitioned from Jiang Zemin to Hu Jintao. Dreams that such elections might be possible at the county level or in the cities were also abandoned. Talk to officials today who were involved with village democracy efforts at the time and they'll tell you they see no hope of the local election efforts being revived under the current leadership. Will the Chinese people rise above cyber-vigilantism and use the Internet to build a just and fair society governed by accountable leaders? Or will the majority be be happy to wield their new-found powers of online speech in random fashion? That's really up to them. People like Liu Xiaoyuan and Yang Hengjun and a number of others have been raising such questions. It's hard to know whether people beyond the elite intelligentsia will pay attention to such concerns. This is why the suppression and censorship of Cultural Revolution history in China is so dangerous. If people could freely write and debate about what happened under Mao, history would have less chance of repeating itself. The last two images in this post are part of a fabulous collection of Cultural Revolution posters belonging to this blogger. FURTHER UPDATE: Before I wrote this post I hadn't seen Joel Martinsen's excellent post over at Danwei, Harnessing Human Flesh Search Engines for Government Use. That adds yet another layer of issues. As contemporary authoritarian regimes learn how to manage and engineer information flows, we must understand that promoting and protecting free speech in places like China and Russia is not a simple matter of "tearing down the wall." Given these governments' complex strategies for regulating what their citizens do online - ranging from establishing effective control of private media and telecoms businesses to allowing people to blow off steam without going too far - we should be more realistic about the true extent of the Internet's transformational potential. The essay is not yet posted on the Project Syndicate website but it has been syndicated in newspapers around the world, including a couple dozen around the U.S. A few have turned up on the web, including here and here. The extent to which most people assume that achieving free speech is a simple matter of lifting or busting through internet censorship "firewalls" is so widespread that the Project Syndicate editors seem to have completely misunderstood our point. They gave our essay the title "Firewalls to Freedom," which implies that firewalls are the barrier to freedom - despite the fact that our entire argument was that freedom WON'T necessarily result in China and elsewhere just by eliminating "firewalls." Clearly our essay was not effective if even our editors didn't get the entire point. I welcome suggestions for how we can do a better job at explaining these issues to a general audience because we're obviously not doing it well. Editors at the South China Morning Post seem to have noticed the disconnect between the original headline and the point of the Op-Ed and gave it a much better headline in today's paper: "Regimes put new spin on internet censorship." NEW YORK - Even the most cold-hearted realists would agree that the failure of Communist censorship played a role in the collapse of the Iron Curtain: Voice of America, the fax machine, rock‘n roll, and the lure of Western capitalism helped to win over the people of the Soviet Bloc. Today, similar hopes are often vested in the Internet, with high expectations that the wealth of online information might trigger the same kind of censorship failure in contemporary authoritarian states that we saw in Eastern Europe - and with the same results. Such expectations are not entirely unfounded, because most Internet censorship systems are not perfect. But, while anybody with a little know-how can figure out how to circumvent, say, the "Great Firewall of China," Internet filtering is only one layer of Chinese Internet censorship. It is also supplemented by an increasingly sophisticated system of manipulation and spin. While the blocking of foreign Web sites was eased during the Olympics, deletion of politically sensitive content from Chinese blogs and chat rooms continued unabated throughout 2008. Now, a new crackdown against "vulgar" Internet content is being used to clean up politically sensitive writings - including discussion of Charter 08 , a pro-democracy treatise signed by thousands of Chinese who discovered it online. Contrary to Western expectations, most of this domestic Internet censorship is carried out not by the government's Internet police, but by Chinese Web hosting companies, which are being held legally responsible for what their users publish. Indeed, the Chinese Internet is evolving and adapting in ways that shore up the regime's legitimacy. Hundreds of thousands of people are employed as freelance Web commentators, working to spin discussions in chat rooms and on blogs in a more patriotic, pro-government direction. Nationalistic young people, proud of China's newfound global economic and political power, gladly volunteer their time to show off their patriotism on the Internet. Meanwhile, China is looking to Russia, which may have invented an entirely new model of controlling the Internet without recourse to censorship. Having established full control of traditional media, the Kremlin is now moving full-speed into the virtual world. The authorities' strategy is not new: establish tight control over the leading publishing platforms and fill them with propaganda and spin to shape online public opinion. The fate of LiveJournal - the most influential blogging platform in Russia, which is often used to express dissent and protest against the government - is one unfortunate example. In less than three years, this popular online resource has been transformed from a respectable American start-up to a shady Moscow-based enterprise, co-owned by the Kremlin's favorite oligarchs. Government propaganda abounds, too, generated by new media operators like Konstantin Rykov, a 29-year-old Duma deputy and the founder of New Media Stars, the Kremlin's favorite Internet firm. Whenever manipulation efforts fail, cyber-attacks offer yet another powerful tool to crack down on dissent without triggering public accusations of formal censorship. This is what happened to a Georgian (known by the screen name cyxymu) who used his blog on LiveJournal to criticize how both governments handled last summer's war. A series of cyber-attacks followed, and was so devastating that the entire service - with its millions of other blogs - crashed, forcing LiveJournal administrators to delete his account temporarily. 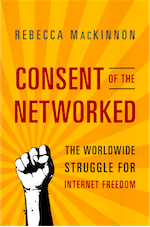 Rebecca MacKinnon and Evgeny Morozov are fellows at the Open Society Institute. The Web was invented so physicists could share research papers. Web 2.0 was invented so we could share cute pictures of our cats. The tools of Web 2.0, while designed for mundane uses, can be extremely powerful in the hands of digital activists, especially those in environments where free speech is limited. On the Chinese Internet this week we have the ultimate marriage of cute cat blogging and political activism - with some official spin-mastering and government p.r. thrown on top. It's known widely as the "elude the cat" incident. A man named Li Qiaoming died in a detention center in Yunnan province. The official explanation was that he had been killed in a rough-horsing accident while playing a game of "elude the cat" (a form of hide-and-seek) with fellow inmates. The reaction in local internet forums was skeptical to say the least, with netizens and even journalists in newspapers and political cartoonists chiming in that the whole thing seemed a bit too incredible. People began to post comments in blogs and chatrooms suggesting that the police were engaged in a cover-up. "Elude the cat" with its rich humor potential quickly became a buzzword all around the Chinese Internet. The injury and subsequent death of the Yuxi city Hongta district Beicheng town young man Li Qiaoming in a detention center has received broad media attention, especially on the Internet. The term 'eluding the cat' has become a hot Internet term in a very short time. In order to satisfy the public's right to know, the Yunnan provincial publicity departhment will form an investigative committee with other relevant departments and proceed to Kunming city Puning town on the morning of February 20 to find out the truth about the incident. We are presently looking for four netizens and other representatives from society to serve as members of the committee. You can register between now and 8:00pm on the evening of February 19, 2009." The notice also included a QQ account number and a telephone phone number. ...more than 1,000 netizens applied though QQ and telephone. Eventually, the investigative committee consisted of 15 persons. There were four representatives from the province political and legal committee, the province procuratorate and the Kunming city public security bureau; three media representatives including the Yunnan Information Times; eight persons from the Internet and other social sectors. It is noted that five of the eight are local Yunnan media workers or have media industry background. Local media was clearly all over the event which was touted as evidence of government openness and transparency, and willingness to submit to "public supervision." As Oiwan Lam reports in Global Voices, there was much debate online about the impartiality and independence of the bloggers who had been selected. Team members were subject to "human flesh search engine" treatment, with netizens crowd-sourcing and analyzing their backgrounds and identities online, and several of them felt compelled to defend themselves online. However while some of the inspection team members apparently asked to see the surveillance video tape of the scene, detention center officials refused to allow viewing of surveillance tapes or allow interviews with key witnesses. Liberal bloggers like Yang Hengjun and Liu Xiaoyuan have written critically about the process and outcome, questioning whether the investigation team and the media coverage surrounding it was little more than a dog-and-pony show aimed at defusing public anger building up online. As Oiwan comments: "My opinion (via inmediahk.net) is that the propaganda department is trying to prevent a public opinion bomb from being exploding but it in turn challenges the credibility of police and justice department." According to Sina's online poll, up till midnight of 20, 87.1% netizens found the explanation of “eluding the cat” incredible, and believed that it must be a lie; 8.2% found the explanation incredible but believed that it might be the truth; only 1.3% believe d the explanation should be the truth. As for the invitation of Yunnan Netizen to participate in the investigation, 49.7% netizens believed that it is probably a show and it is yet to see the effect of the participation. 45.5% said that the arrangement is creative and can further develop democracy, it shows the investigation is open and transparent. We will never have a real civil society, a democratic society, unless people take responsibility. ...I believe the desire for justice and equality is something that people must have in their own hearts. This isn't something that one person can give to another. This is a right that must be exercised. If you don't exercise your right society will be in a difficult state. In the government handling of the “eluding the cat” case we can glimpse an eerie phenomenon emerging in China: the rise of virtual political participation as a proxy and foil for real political empowerment. Notice, political rights are not on offer to China’s citizens. But if we believe the hype China’s state media are selling us, China’s “netizens” are in political ascent. Beijing legal crusader gets "dealt with"
This interview with lawyer-blogger Liu Xiaoyuan was shot by Danwei.org in November. Liu writes today that he is being forced by the Haidian District Justice Bureau to shut down his law firm for six months. This means, he says, that he and all of the lawyers who work at his firm are "unemployed for six months." As Global Voices Advocacy explains, the official reason for disciplinary action against his Yi Tong Law Firm is that the firm employed a lawyer who does not have a license to practice law. As Liu explains, Li Subin, the employee in question, was working as a legal assistant, not as a full lawyer. Li had his license suspended after accusing the Henan Justice Bureau of charging excessive lawyer registration fees back in 2001. The real reason for the punishment, Liu believes, is that lawyers in his firm had petitioned last year for direct elections of the leadership of the Beijing Lawyers Association. He says the goal is to drive his lawyers to flee to other firms and cause the Yi Tong law firm to fail. He points out that this is the same tactic used against civil rights lawyer Gao Zhisheng. This is non-trivial, given that Gao went on to be tortured, spoke out about it, and has now disappeared. I have written about Liu in the past here and here. Liu is a prolific blogger and defense lawyer who writes passionately about the cases he is involved with and other cases he follows. He has not shied away from controversy in the past couple of years. Perhaps most controversially, he represented family members of Yang Jia, the confessed cop killer, arguing on his blog that while the defendant may have been guilty he was not afforded due process under Chinese law. He called attention to various shenanigans pulled by the prosecution around the time of the trial, such as the illegal detention of Yang Jia's mother in a mental institution. Public sympathy for Yang Jia was widespread - discussion of the case around the Chinese Internet was arguably more widespread than, say, Charter 08 and also potentially much more threatening to the regime in the immediate term. What kind of person is afraid of this kind of man? Only those people who inhabit the dark corners of the legal system, who don't want to see the common folk win, those people who are aided by evil forces, those people who want China to forever belong to a small minority, people to whom you cannot speak reason. Speaking out for Liu Xiaoyuan is speaking out for everybody. When we have justice we won't need others to speak out for us. We must protect those who seek justice just as our great nation cherishes CCTV, or otherwise there won't be anybody left to speak up for you. Brother Xie Yong has said of the post 1949 regime: "Whoever is right should be ignored." We can imitate his words to say of today's regime: "Whoever doesn't obey is dealt with." That is the picture of the conditions Chinese people are living under today. ...and he rolls on from there.. ouch..
Cyberspace has clearly become one of the liveliest public forums in China, despite the efforts by the Chinese government to control online access and content. China's netizens have become more skillful and assertive in utilizing the Internet to voice their opinions and, occasionally, force the Chinese government to become more responsive. But the Internet has also allowed more nationalist and radical views to contend for influence and sway public opinion. How is online public opinion changing Chinese society? Will the new freedoms found in the virtual world lead to greater political participation or help fuel resurgent nationalism? How is the Chinese government responding to online activism? Rebecca MacKinnon, a veteran journalist and an astute observer of the Chinese media, will share her most recent research concerning online politics in China on February 18 at the Carnegie Endowment. Because space is limited, please confirm your participation as soon as possible. Rebecca MacKinnon is a 2009 Open Society Fellow and is currently writing a book tentatively titled Internet Freedom and Control: Lessons from China for the World. Ms. MacKinnon operates the blog Rconversation and is cofounder of Global Voices, a global citizen media network. She additionally serves as an assistant professor at the University of Hong Kong's Journalism and Media Studies Centre, where she teaches online journalism and conducts research on the Internet, China, and censorship. Fluent in Mandarin Chinese, she was previously CNN bureau chief in Beijing and in Tokyo. Minxin Pei is a senior associate in the China Program at the Carnegie Endowment for International Peace. His research focuses on democratization in developing countries, economic reform and governance in China, and U.S.-China relations. He is the author of From Reform to Revolution: The Demise of Communism in China and the Soviet Union (Harvard University Press, 1994) and China’s Trapped Transition: The Limits of Developmental Autocracy (Harvard University Press, 2006). Pei’s research has been published in Foreign Policy, Foreign Affairs, National Interest, Modern China, China Quarterly, Journal of Democracy, and many edited books. Pei is a frequent commentator on BBC World News, Voice of America, and National Public Radio; his op-eds have appeared in the Financial Times, New York Times, Washington Post, Newsweek International, International Herald Tribune, and other major newspapers. Pei received his Ph.D. in political science from Harvard University. I've written about Chinese blog censorship before, most recently in December. In August I wrote an Op-Ed for the Asian Wall Street Journal, titled The Chinese Censorship that Foreigners Don't See, which was also based on my Chinese blog-censorship research project funded by the University of Hong Kong. Now First Monday has published my full academic paper, Chinese Censorship 2.0: How companies censor bloggers. Most international discussion of Chinese Internet censorship focuses on only one layer: the filtering or "blocking" of websites. My paper aims to shed light "on another part of China’s Internet censorship system: The process of domestic Web site censorship by which domestically hosted content is deleted completely or prevented from being published in the first place. The whole process is carried out almost entirely by employees of Internet companies, not by “Internet police” or other government officials. This study focuses specifically on one small piece of this domestic censorship system: How blog service providers (BSPs) censor blogs written by their Chinese users." "This study explores an under-studied layer of Chinese Internet censorship: how Chinese Internet companies censor user–generated content, usually by deleting it or preventing its publication. Systematic testing of Chinese blog service providers reveals that domestic censorship is very decentralized with wide variation from company to company. Test results also showed that a great deal of politically sensitive material survives in the Chinese blogosphere, and that chances for its survival can likely be improved with knowledge and strategy. The study concludes that choices and actions by private individuals and companies can have a significant impact on the overall balance of freedom and control in the Chinese blogosphere." For more, read the whole thing. Let me know what you think. The two photos below were taken by Sharon Hom of Human Rights in China around 10:30 a.m. last Friday in Geneva. Diplomats from a wide range of countries lined up for hours for a chance to sign up that afternoon for speaking slots in the U.N. Human Rights Council's review of China which took place on Monday morning. 111 countries signed up. The first 60 countries on the sign-up list got a chance to speak. (Click here to download the full PDF report of Monday's review, including short summaries of what all the speakers said. Click here to download a PDF chart compiled by HRIC listing all the recommendations that China rejected.) Australia and Canada got up early to be at the front of the line, and both expressed concerns about the Chinese government's human rights record. The UK and other European governments expressed concern later on. But voices of praise for the Chinese government's human rights record predominated. Overall, the session was considered a victory for the Chinese government's position that it is on the right track when it comes to respecting the rights of its people. Where was the U.S. delegation in this line? U.S. diplomats made no attempt to stand in this line. Much to the outrage of human rights groups, the Obama administration chose to merely sit on the sidelines and quietly take notes. The timing could not have been worse, given that Secretary of State Hillary Clinton is going to China next week. This week's silence puts all the more political pressure on her not only to speak strongly but to produce results, which gives the Chinese foreign ministry and Hu Jintao's government the upper hand. As much as the Chinese government appears to resist outside pressure to improve its record, experience suggests that it does respond to such pressure. American interventions on behalf of jailed government critic Hu Jia contributed to his being moved to a prison closer to his family; sustained international pressure on the Chinese government to permanently relax rules on foreign journalists in China resulted in success. Ordinary people in China will also appreciate hearing the United States raise human rights issues in ways that echo their own day to day concerns about rule of law and government accountability. And we urge that you be mindful of the converse: that the Chinese government and people take careful note when the US is silent. Our first indication of Clinton's approach will come on Friday at 1pm New York time, when she gives a speech to the Asia Society . There will be a live webcast here. You can also post questions or comments in advance here. Event Time: 5:30 - 7:30 p.m. The Open Society Institute and Asia Society will host an event with Open Society Fellows Rebecca MacKinnon and Evgeny Morozov that explores the changing landscape of Internet censorship. Special attention will be given to the techniques employed by governments to co-opt and steer online discussions in ideologically convenient directions. Focusing on the specific cases of Russia and China, the panelists will discuss how the strategies and tools of control, manipulation, and censorship have evolved in both countries. Isabel Hilton, editor of China Dialogue and an Open Society Fellowship selection committee member, will moderate the discussion. Light refreshments will be provided at a reception from 5:30 - 6:00 p.m. The discussion will begin at 6:00 p.m. This event is presented in cooperation with the Asia Society Center on U.S.-China Relations. This event will be streamed live online. Click here to view. Photo above: An Amnesty International member covers her mouth during an event in Sydney on July 30, 2008, as part of a campaign to end Internet censorship in China. The UN Human Rights Council is offering a live webcast of its review of Chinese human rights at 9am Monday morning Geneva time. That's 4pm in Beijing, or 3am on the U.S. East Coast. I probably won't manage to be awake for it, but I look forward to watching the archive, and look forward to seeing the reports and reading the impressions of others who were in better time zones to watch it live. Please feel free let me know your views in the comments section of this post if you have a chance to watch it. Peter Ford at the Christian Science Monitor has a useful backgrounder. He calls the session "a key test of Beijing's readiness to answer international criticism over its treatment of political opponents." China's report to the council is here. Amnesty International called it a whitewash. Human Rights in China has a detailed position paper here. David Miliband, Secretary of State for Foreign & Commonwealth Affairs, U.K.
On Monday, your representatives will participate in the U.N. Human Rights Council's first review of China's human rights record. As part of the review, countries are required to submit their questions in advance, and CPJ welcomes your questioning of China's press freedom record. As countries with a deep commitment to freedom of expression and human rights, we urge you to ensure that China responds to the specific issues outlined in this letter. We have grave concerns that they will not be adequately emphasized. January 2007 regulations that eased restrictions for foreign journalists reporting in China during the Olympics were permanently extended in October 2008. Granting reporters the legal right to do their work is a positive step, as is the investment in media infrastructure which China outlines in its national report to the review working group. Yet review participants should ask China how the regulations can be implemented throughout China. Colleagues there tell us they are frequently subject to harassment by local authorities and cannot enter the Tibetan Autonomous Region without permission. The working group should also ask China to extend legal protections to local journalists, who self-censor because they lack equivalent freedoms, as well as to sources who agree to interviews with foreign journalists. China's laws allow the government to block or hide politically sensitive information on international Web sites, including news outlets such as the BBC and advocacy organizations like CPJ. Controls on local Web sites appeared to tighten in 2009. A government campaign targeting vulgarity online launched on January 5 has broadened the conception of "unacceptable" content in a way that also threatens free expression. City authorities in Beijing shut down blog-hosting site Bullog on January 12, according to local and international news reports. The site, popular among intellectuals and political commentators, had failed to remove "harmful" information, according to the reports. China must revise Internet legislation before it is in compliance with international human rights standards. * Release journalists imprisoned for their work. China has consistently jailed more journalists than any other country for the past decade. CPJ research shows that at least 28 journalists and Internet users who publish news and opinion online were incarcerated in China as of December 1, 2008. * Define anti-state charges, such as possessing state secrets or inciting subversion, to limit their retributive use against journalists and online critics. Web site publisher Huang Qi was charged with possessing state secrets on February 2 after disseminating news about earthquake relief efforts in Sichuan on his Web site, according to international news reports. He still suffers from poor health induced by an earlier five-year jail term that he served for publishing allegedly subversive articles on the site. * Protect lawyers who defend free expression. Imprisoned journalist Zheng Yichun has lacked legal counsel since his lawyer, Gao Zhisheng, also came under suspicion for subversion based on online articles. Gao, who has been detained several times and accuses security officials of torturing him while in their custody, was taken by security forces again for two weeks in 2009 before his release on February 3, according to overseas human rights groups. The reason for that detention is not clear. * Independently investigate allegations of torture. Yang Maodong, imprisoned since 2006 for illegally publishing a magazine which reported on a high-profile graft case, has staged hunger strikes to protest physical abuse at the hands of officials in a Guangdong prison, southern China, according to overseas rights groups. * Independently investigate violations of criminal procedure. Prominent writer Liu Xiaobo was detained on December 8. Officials did not inform his wife of his detention within the designated 24-hour period and he is still missing, though charges have not been filed, according to international news reports. His lawyer told CPJ that security officials believe he drafted the unusually frank public call for political and legal reform known as "Charter 08," which was published online on December 9, Liu was one of more than 300 people from a broad sector of society to sign the charter, which has continued to garner support since his detention. * Abolish government-issue journalist permits. Journalist Jiang Weiping wrote about a corruption scandal for a Hong Kong magazine in 2000, but will never work as a journalist in China again. He was arrested and served six years for inciting subversion and state secrets charges prior to his release in 2006 and can no longer get a government-issue ID to work as a journalist. The three-year suspension of his political rights attached to his sentence barred him from leaving the country. He was able to obtain the assistance of the Canadian government early this year and left China for Canada on February 4, according to his wife, Stella Lee, who has lived there since 2004. As China notes in its national report, press freedom guarantees are included in China's constitution. But the existing legal framework and its application by Chinese officials prevents them from being effectively implemented. The Universal Periodic Review offers a unique opportunity to establish and hold China to specific steps for bringing its press freedom record in line with international norms. The Human Rights Council was created as an alternative to the widely discredited U.N. Commission on Human Rights. The only way for the council to be effective on issues such as press freedom in China is for countries like yours to openly confront China on its record. We are counting on you to do so.